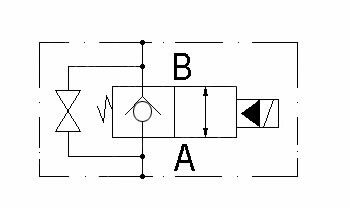 The poppet valves are sub-divided into four types to distinguish between their switch function.The flow from A to B for valves of Typ 1 is closed during deenergized solenoid (closed electroless). Type 2 valves are open electroless and are the counterpart to type 1. The flow from A to B and B to A for for valves of Typ 3 is closed during deenergized solenoid. Type 4 valves are open electroless and are the counterpart to type 3. Valves of Nominal Size 6 allow a flow of maximal 40 l/min and have a G3/8 connection thread". 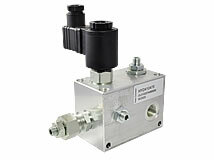 Valves of Nominal Size 10 allow a flow of maximal 70 l/min and have a G1/2 connection thread". Balanced 2/2-Way-Seat Valve (solenoid-valves), aluminium casing, with emergency sink. Leakage free poppet version, minor flow resistance, short switching time. Electroless A -> B closed, Current applied open. Electroless closed, Current applied open. Electroless open, Current applied closed. Electroless open, current applied A -> B closed. Balanced 2/2-Way-Seat Valve (solenoid-valves) in an aluminium casing, with emergency sink. Directly controlled 3/2-Way-Sliding valve ( Solenoid valve), aluminium casing. Leakage: max. 40 cm³/min at 210 bar. Electroless P <- -> C1 open. 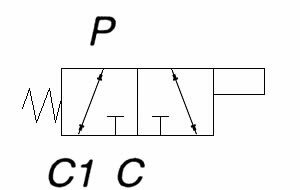 Current applied P <- -> C open. This Valve is used to control single-acting cylinders. Common applications are hydraulic elevating platforms and tables with single-acting cylinders and electrically operated pumps. The cylinder extends by turning the pump on. It will be Leakage free and remain in its position when the pump gets switched off. Applying current to the solenoid valve will lower the cylinder due to its intrinsic weight, the speed can be adjusted via the integrated choke. Pump and user are protected against overload by a pressure relief valve. It is compatible with the Seat-valves, Lifting/Lowering valves and Sliding valves from our shop. The 205V DC coil gets used with an upstream reticifier for the application with a 230V AC.